Comments: Clean and Unmarked Copy. The dictionary & phrasebook series now offers 67 languages! Each book comprises an introduction to the language, an alphabet and pronunciation guide, a basic grammar, a two-way dictionary, and a phrasebook. The grammar section presents the language's main features, such as verbs, nouns, adjectives, gender and declension. Easy-to-follow explanations enable users to have simple conversations with native speakers. 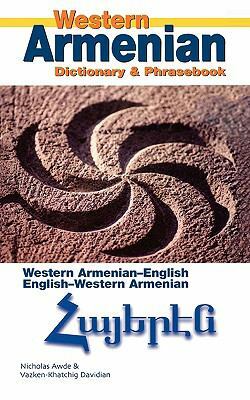 Western Armenian is the language spoken by most of the seven million Diaspora Armenians who live outside their historic homeland. Western Armenian speakers form the majority of Armenian spoken in the United States, Iran, and the Middle East. The language has helped to preserve a unified Armenian sense of identity and common cultural heritage throughout the world. This Dictionary & Pharsebook, an extension of that cultural heritage, offers insight into the historical roots of the Diaspora and provides an invaluable reference to the language itself. The book contains a resourceful two-way dictionary, an informative grammar section, and a collection of travel-oriented phrases. Armenian has its own unique alphabet, but to facilitate pronunciation, this book uses a commonsense Roman transliteration system.Awde, Nicholas is the author of 'Western Armenian Dictionary & Phrasebook Armenian-English/English-Armenian', published 2006 under ISBN 9780781810487 and ISBN 0781810485. Loading marketplace prices 136 copies from $9.71 How does the rental process work?